The Cayos Cochinos or Cochinos Cays consist of two small islands (Cayo Menor and Cayo Grande) and 13 more small coral cays situated 30 kilometres (19 mi) northeast of La Ceiba on the northern shores of Honduras. 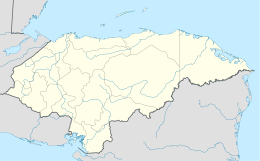 Although geographically separate, they belong to the Bay Islands department and are part of Roatán municipality. The population numbered 108 at the 2001 census. The total land area measures about 2 km2 (0.8 sq mi). The islands are a Marine Protected Area and are managed by the Honduran Coral Reef Foundation. The coral reef here is part of the world's second largest coral reef system known as the Meso-American Barrier Reef. There is a scientific research station on Cayo Menor, the smaller of the two main islands in the system. National Geographic writes, "The waters around this collection of coral cays are a marine biologist's dream: protected by the government, off-limits to commercial divers and fishermen, and busy with creatures that may not yet have names." The Cayos Cochinos archipelago has no roads, cars or bikes. There is a hiking trail that connects residences and beaches on Cayo Grande. There is a lighthouse on the highest point of the island which can be hiked to through scenic jungles which are home to the only pink Boa Constrictors in the world. The only inhabitants of the islands are Garifuna fishing villages (Chachauate and East End), 9 private homes on Cayo Grande, and 6 homes on the 13 smaller keys. The islands are accessible by boat from La Ceiba or by sailboat charter departing from Utila or Roatan. The actions taken in preserving the underwater environment has left the Cayos Cochinos waters as the healthiest and most pristine marine life in the Bay Islands. The Honduras Coral Reef Fund is responsible for upholding the environmental restrictions and protecting the marine park, and collect a park entrance fee from all those who enter. Both Garifuna villages offer cheap lodging for backpackers who wish to stay in either East End or Chachahuate in hammocks or hostel-like huts. Established as a key area of the Mesoamerican Barrier Reef System, the Cayos and surrounding waters were declared a marine reserve in 1994, with the help of the Smithsonian Institution, in order to protect all marine and terrestrial flora and fauna within a 460 km² area. The reserve extends eight kilometers in all directions. Laws prohibit all commercial fishing, netting, and trapping within the marine park. Local Garifuna are permitted to fish with hand lines, but prohibited from netting and spearfishing. In designated areas, there is a lobster diving season for qualified Garifuna fishermen. Since 1994, the Smithsonian Institution, World Wildlife Fund (WWF), Honduras Coral Reef Fund, Operation Wallacea and other non-profit organizations have helped preserve the natural beauty of the area. ^ National Geographic (2008-02-01). "Dive an Untouched Reef". National Geographic. Archived from the original on 2011-02-03. Retrieved 2010-11-08. ^ Tropical Rez (2006). "About Cayos Cochinos". Bay Islands Tourism. Archived from the original on 2011-01-30. Retrieved 2010-11-08. Wikivoyage has a travel guide for Hog Islands.